College Park continues to experience the fall weather that we missed out on over the past few weeks. We had below normal temperatures today with highs in the low 60s compared to the average high of 69°F this time of year. The forecast continues to show colder air moving in bringing even colder temperatures later this week. Tonight clouds will gradually clear throughout the night, and lows will fall into the upper 40s, about average for our area. Winds will be from the southwest at 4-8 mph. This will be one of the warmest lows for the rest of the week. Sunny skies will make temperatures slightly warmer but still reaming slightly cooler than average with highs in the low 60s. Winds will increase to 7-16 mph from the west with gusts as high as 30 mph. Tomorrow evening will remain mostly clear, allowing temperatures to fall into the lower 40s with winds shifting from the Northwest at 9-13 mph. Thursday will be similar to Wednesday except that colder air from the northwest will flow in keeping our highs only in the low to mid 50s. The sky will be sunny, but it will feel much colder, especially since the wind is predicted to be from the Northwest at 9-12 mph with gusts over 20 mph. The evening will remain mostly clear, allowing the temperatures to fall into the upper 30s. 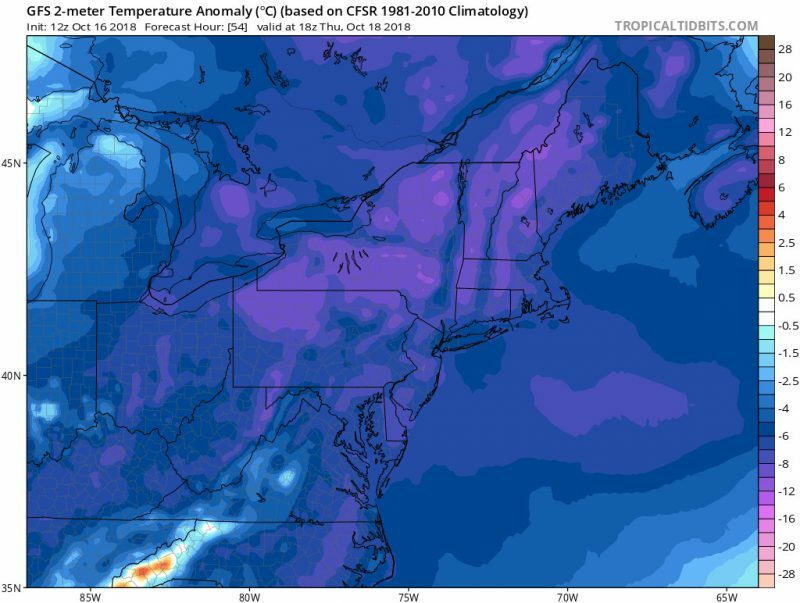 These images from Tropical Tidbits shows the GFS prediction temperature anomalies. 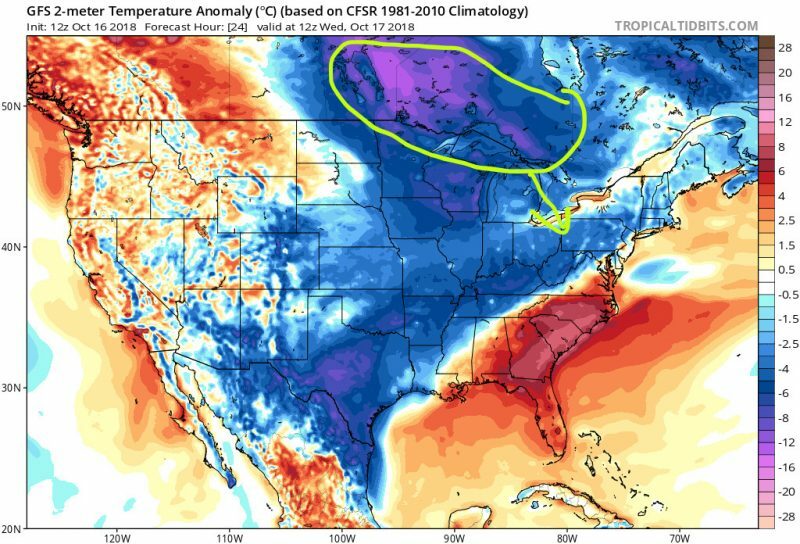 The top image shows the cold air in East Central Canada on Wednesday morning approaching the Northeast region. The bottom image shows just the Northeast region at Thursday Afternoon. This shows significant below normal temperatures across almost the entire region. The high temperatures in the DMV region are generally predicted to be about 8-10 degrees below normal on Thursday. Looking ahead into the weekend, there is a chance of showers on Friday and early Saturday, but the rest of the weekend is looking dryer and still generally cooler than average over the DMV. Fall temperatures are here to stay.